The number of people entering training to become priests in the Church of England is at the highest level for a decade with women making up more than half the total, according to new figures released this week. 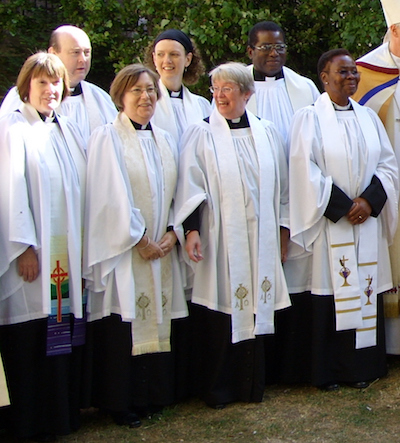 A total of 544 men and women are starting training for ordained ministry this autumn (known as ordinands), an increase of 14% on last year and the highest figure for 10 years, according to statistics from the Ministry Division of the Church of England. Women make up more than half of those entering training, or 274 ordinands, the biggest intake of female ordinands for a decade, and an increase of 19% compared to last year. At the same time, the number of younger ordinands, in the under 32 age group, rose by nearly two-fifths, and now accounts for 28% of the total. The figures, covering the period from 2008 to 2017, are published alongside Ministry Statistics for 2016 showing the number of women serving in ordained ministry in the Church of England rose by 7% from 5,310 in 2013, to a record high of 5,690 last year. However women still make up less than a third, or 29%, of the total number of active clergy. The annual statistics also show a fall of just over 2% in the number of serving clergy from 20,020 in 2013 to 19,550 in 2016, reflecting an increase in the numbers of clergy reaching retirement age. The number of clergy in paid positions fell by 4% during the same period, from 8,120 in 2013 to 7,790 in 2016. The proportion of clergy in paid positions from black and minority ethnic communities remained largely unchanged in 2016, at 3.5%. The figures have been released as the Church of England steps up efforts to increase the number of candidates for ordination by 50% by 2020 as part of the Renewal and Reform programme, with an emphasis on increasing the number of women and the youthfulness and ethnic diversity of candidates for ordination. Director of the Church of England's Ministry Division, Julian Hubbard, said: "The increase in numbers of those called to serve as clergy reflects a great deal of hard work, especially in the dioceses and local churches, but also the persistent and dedicated prayers of many in the churches both during the post-Easter prayer campaign for vocations and throughout the year. We are thankful for God's generosity and goodness shown in the gifts we have been given. "We are mindful, however, that significant work still remains to be done to improve the age profile, gender and ethnicity of our clergy to better reflect the makeup of our congregations and the wider population. We continue to seek prayers and support for this to be achieved." Mike Eastwood, Director of the Renewal and Reform programme, said: "The overwhelming majority of the work of Renewal and Reform is about encouraging and inspiring the church at parish and diocesan level in its work of evangelism, mission and fostering vocations to lay and ordained ministry and leadership. "We hope that these figures published today will inspire us all and remind us of what still needs to be done towards fulfilling our goal of providing a hopeful future for the Church of England in which we can once again become a growing church for all people in all places." Photo (David Burrows / Shutterstock.com): Part of the clergy team at Southwark Cathedral.